What if I told you there was something you could do this holiday season that would make you feel like you had more hours in the day, while also increasing self-confidence, improving physical health, and creating long-lasting memories that you treasure forever? Sound too good to be true? It isn't. A recent study from the Wharton Business School at the University of Pennsylvania found that when people volunteered—carving out even a small amount of time in their day to help someone else—they experienced feelings of efficiency and competence. These feelings gave people the sense that they could do quite a bit with their limited time. In other words, when you give time, you feel like you have more time. If you have kids, it’s a parenting no-brainer to get involved in a service project this holiday season. Several studies have shown that kids who volunteer experience a positive effect on their grades, attitudes toward education, and self-esteem. Volunteering also leads to reduced drug use and huge declines in dropout rates and teen pregnancies. There is also research linking youth volunteering to a higher quality of life as an adult, and showing that families that focus more on the material side of the holidays tend to feel less happy than families that focus on spending time together. What better way to spend time together than volunteering? It’s really the best gift you can give your children and yourselves. I started incorporating service projects into our family’s holiday traditions a few years ago after I read a book that emphasized the idea that rituals are about passing down your values and beliefs to your children. And it hit me that even though I always tell my kids that Christmas is about giving, it had really become more about baking and wrapping and singing, with a token volunteer project thrown in. "Studies have shown that kids who volunteer experience a positive effect on their grades, attitudes toward education, and self-esteem." Although these family rituals are still important to us, I realized that I also wanted to establish service as a huge part of what we do during the holidays. The kids liked it so much that it stuck, and we tend to do one service project a month. Part of the key to our success with the projects is letting the kids pick out what they want to do. My oldest loves animals, so she tends to pick animal-focused charities. My middle daughter is all about art, so she likes anything that involves painting, making cards, or assembling craft kits. My little one just wants to keep up with her sisters, so she’s happy for now just imitating what they’re doing. For our family (or maybe really for me), the simpler the project, the more successful it’s been. When December rolls around, have your kids go through their toys and clothes and find some that they can donate to Goodwill or a homeless shelter. Explain that, for many parents, buying gifts for friends and family may be difficult, so this is a way to help these families out. 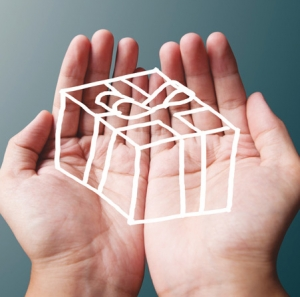 If you encounter resistance, the “make room for new presents” strategy can be very persuasive. You can also make a “giving box.” Have the kids decorate a large box to serve as a collection box throughout the season or the year. Every time they outgrow an item, they can toss it in the box. When the box is full, take it to a charity or schedule a pickup at your house. My kids love art projects, so this is a very popular activity. You can go to Hugs and Hope or Send Kids the World to find information about sick children who are eager for “happy mail.” There are even photos of the kids, which makes it a more personal experience. Or, you can deliver cards to a local nursing or veteran’s home. In addition to greeting cards, you can make Christmas decorations like paper chains or snowflakes, which are a great way to brighten what may be an otherwise dreary environment for people. The Adopt A Soldier program is a wonderful opportunity to teach your children about the sacrifices that military service members make for our country. You can sign up for a one-time commitment, and assemble a holiday care package to send. My youngest child, who is animal obsessed, isn't quite old enough to volunteer at a shelter, so we often make treats and toys to drop off. There are lots of great ideas online: for example, we’ve made toys using my husband’s mateless socks; we just put a tennis ball or two in the sock, tie a knot at the top, and the kids decorate the socks with non-toxic markers. Find a local animal shelter here. We also make bird feeders out of pine cones, peanut butter, and bird seed. Donate food to a food bank this holiday season. Some families buy the same ingredients that they use for their holiday dinner and donate them to a food bank, which can make the experience more meaningful for a child. Better yet… when you drop off the donations, stay for a while and help pack boxes and sort food. To find a food bank near you, go to Feeding America. My sister-in-law was organizing a clothing drive for a family she knows that lost their home during Hurricane Sandy, so I sent out an email to our friends and family and asked for donations. It was amazing how many generous donations we received. Often, people want to help but they just don’t know how. There’s an organization called The Joy of Sox that collects new socks for the homeless. Many cities have what they call “sock drawers” or collection sites, or you can mail the socks to the organization’s headquarters. If you’re hosting a holiday party or gathering, you can ask people to bring a new pair of socks. Or you can ask people to bring an unwrapped toy and deliver them to Toys for Tots. Last year, my husband and I were at a loss as to what to get our parents for Christmas. We finally came up with the idea of sponsoring a holiday party at St. Jude in their names. We donated the money to sponsor the party and purchased ornaments with the St. Jude logo. On Christmas Day, we gave them the ornaments with a note attached explaining that that very day, a Christmas party was being given in their name at St. Jude’s. My mom cried, which in our family signifies a successful gift. Often you can find giving trees at churches or malls, where you can pick a tag off the tree and buy a gift that has been requested. One year, my kids were really moved by a child who had requested socks and Tupperware for his mom. If there’s no giving tree near you or you want to do more for a family, check out The Box Project. This was one of my family’s favorite projects. At first, I thought it was going to be a big hassle because I don’t sew. But then I realized that there’s absolutely no sewing involved. You basically take two pieces of fleece and cut fringe around the edges. Then you knot the fringes to make a nice, plush blanket. For instructions, visit Project Linus. These blankets can be dropped off at animal shelters, homeless shelters, pregnancy centers, etc. Project Linus also has drop-off information for local chapters on their website. It can be hard to make volunteering a habit, especially during the holiday season when routines are often a bit out of whack anyway. What works for my family is to take down the big family calendar and actually write in the service projects on the days we plan to do them. Because we cannot function without our calendar, it is a constant reminder of our goals. Moreover, I don’t just write down the project on the day. I also write things like “Buy bird seed” two days before the actual project date. Without those kind of reminders, it’s just not going to happen in our house. The advantage of the calendar is that you can plan out the whole year like this: every month we pick a Sunday afternoon that it is our volunteer day, and, for the most part, it gets done. Other families use an Advent calendar. Instead of filling the envelopes or boxes with candy or trinkets, they put slips of paper in. And, rather than have a service project every day of the week, they mix in slips of paper that say things like “Watch a Holiday Movie,” “Go Ice Skating,” “Give Someone in Your Family a Hug Today,” etc. My daughter’s Daisy Troop made an advent paper chain—the chain has 25 slips of paper, and each slip has a suggestion written on it. 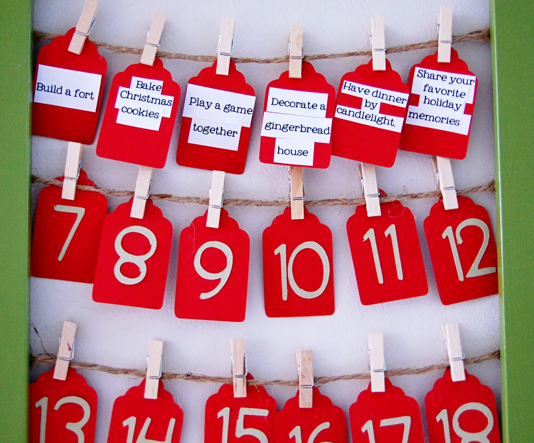 So even if you don’t have an Advent calendar, you can make one with construction paper, scissors, and glue. And it makes for a pretty Christmas decoration, too. Much like picking a project, the key is finding a structure that works for your family. I would love to have a pretty Advent calendar hanging in my entryway, with my family participating every night in a meaningful activity right out of a Norman Rockwell painting. But I’m honest enough with myself to know that a plan like that would completely stress me out and just not happen. And then I would be disappointed with myself at the end of the month. So I write things on the calendar. We make sure to go ice skating and drink hot chocolate at least once during the winter (we don’t even limit ourselves to December!). We have one big cookie-making party where more sprinkles end up on the floor than on the cookies. We spend as much time with extended family as we can. We go to Christmas Eve mass. And we do a service project every Sunday. One of my favorite quotes about the holiday season is from Hamilton Wright Mabie: “Blessed is the season which engages the whole world in a conspiracy of love.” Because of our service projects, our conspiracy of love now reaches out way beyond the confines of our little house. And this is exactly what I want to pass down to my kids each holiday season. Create a holiday wishlist on SoKind! With New Dream's online registry tool, SoKind, you can encourage your family and friends to give gifts of time, handmade goods, charitable donations, or other items that you actually need or want. For inspiration, check out this sample wishlist from the Smith family! Or, prioritize giving over receiving by creating a "reverse registry" or GiveList on SoKind, where you make a list of gifts you want to give to your loved ones. For inspiration, check out this sample reverse registry from the Mickelson family!